So Comfortable To Sleep In! Although I would love to take credit for this amazing idea.... I am not the creative genius behind these sponge rag rollers. This is a (gasp) copied design! I first saw this idea on Pinterest (where else?) which led me to a very fun blog called The Mother Huddle, which you should definitely check out! I'm typically not really much of a crafter, but this is one of those projects that I could not pass up. No sewing or gluing involved, very quick and easy, fairly inexpensive, and a great end result. These heatless curlers needed to happen, and needed to be shared! 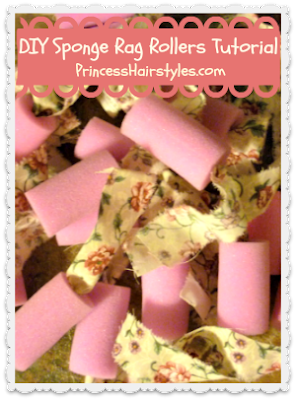 We have always loved the overnight curls created by using standard sponge (or foam) rollers. I remember wearing these when I was a little girl, so they have been around for a long time! But "The Princess" doesn't particularly enjoy sleeping in them because the plastic clamps (which hold the curler to your head) typically end up poking her during the night. We have also had problems with her long hair getting snagged and tangled around the edges and hinges of these rollers, which can turn into a nightmare when it is time to take them out. And, as much as I love classic "rag curls" (as they are comfortable to sleep in) rag curls are not my favorite curling method because sometimes the curls can end up being very tight and frizzy looking. These sponge rag rollers really do make awesome, smooth, uniform curls (as shown below) with no discomfort while you are sleeping, or snags while taking them out! * Foam/sponge rollers. 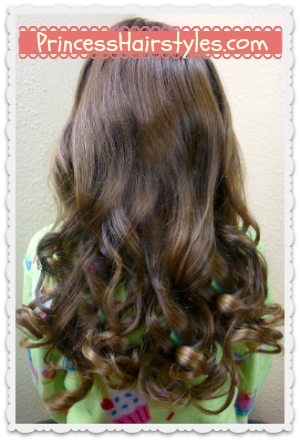 We opted for the largest size of sponge rollers we could find, as we wanted soft, loose, and bouncy curls this time. You can definitely purchase smaller rollers if you prefer tighter curls. The ones we ended up buying are made by "Conair" and I noticed at least 3 different sizes available and several other brands while we were looking. Of course it will depend on your hair texture and length, but we used 15 rollers total. *Scrap fabric. If you have an old pillowcase, that will work great! 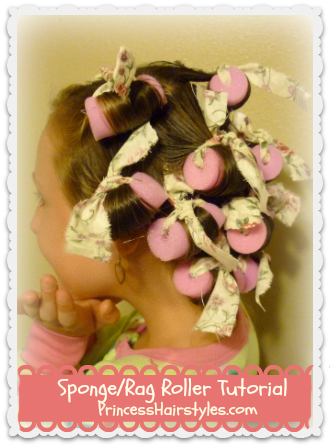 Enjoy our video tutorial below, as the princess herself teaches how to make these rollers! These curls are going to come out a little bit different depending on how you wrap them up. We chose to wrap them horizontally this time, which creates more of a tousled, natural looking curl. You could wrap them vertically instead for more of a spiral look. I literally gasped when I saw how beautiful her hair turned out! Will definitely be giving this a go on my own hair. May I also comment what a wonderful blog this is - something so special between mother and daughter. I stumbled across you after googling "best lifestyle blog" and I'm certainly glad you are what popped up.